In February 2017 the Parish Council had a report of the two drop-in sessions to consider the possibility of a Neighbourhood Plan for Queniborough. Given the attendance at the sessions, the range of comments supporting the need for a plan and the issues raised about the future of the village, the Council agreed to support a plan for the village and that Queniborough should be registered with the planning department at Charnwood as a Neighbourhood Plan area. Anyone interested in helping with the development of the plan or would like more information about it please contact Kate Hill (katehill134@btinternet.com or tel: 0116 2608926). Our planning consultants, the Rural Community Council, have produced our first draft of the Neighbourhood Plan. They identified the information gaps and the evidence that we need to obtain to have our best chance of the Neighbourhood Plan being approved and so the questionnaire was developed, building on our initial consultation in September 2017. A copy was delivered to every house in the village with the Queniborough Gazette. A Youth Questionnaire for ages 11 - 18 was also availbale online, as was the household questionnaire. Thank you to everyone who completed the questionnaire. They all go towards safeguarding Queniborough's future. The consultation period has now ended and the results are being analysed. Once this completed then the results will appear here and a report will be given in the Queniborough Gazette. The Queniborough Neighbourhood Plan Steering Group has twelve members. The Steering Group has a constitution, approved by the Parish Council, and a Code of Conduct and a Complaints Procedure. The Parish Council is the authorised body for neighbourhood planning in Queniborough and monthly reports are given to the Parish Council. There will be reports in The Queniborough Gazette of progress on the Neighbourhood Plan and how you can be involved and have your say on how the plan develops. 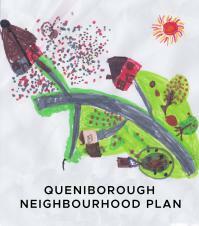 A consultation on the future of the Neighbourhood Plan for Queniborough took place at the Village Hall on 30th September 2017 from 3pm to 7pm. The Main Issues that were raised at the consultation can be seen below. The Issues are in the priority order based on the number of comments made during the consultation and from written comments received. Minutes of each Steering Group Meeting are approved at the following meeting and will then be published here. Minutes of the Neighbourhood Plan Steering Group Meeting held on 12th June 2918. There was no Steering Group meeting in July or August due to holidays and work being carried out in working groups. There was no Steering Group meeting in October or November as work proceeded on the first draft plan. One of the most important jobs the Steering Group has to do is to keep all the residents of Queniborough informed of progress of the Neighbourhood Plan and how they can be involved and ensure their views are taken in to account. Regular updates will appear in the Queniborough Gazette and copies can be found here.